We’re at Dai Jang Gum Korean restaurant at least once a week and there’s something comforting when it’s your usual. We have our own table at the back next to the Korean doll display and right under the TV screen that pumps out K-Pop and Korean tourism messages. Tonight I’m on my own and the owner greets me with a complimentary Korean pancake, watch the video above and you get an idea of its huge size… and the wonderful atmosphere of Dai Jang Gum. She entreats me to try something new and recommends the fish roe clay pot rice. I oblige, it’s always good to try different things, I think. This dish, she says is a variation of bi bim bap with beef and egg replaced by fish roe. What I wasn’t prepared for was how much I’d enjoy it, or how there was a special way of cooking it. The owner brought the dish to my table and showed me how it’s done. And I’ve captured it on video, below. 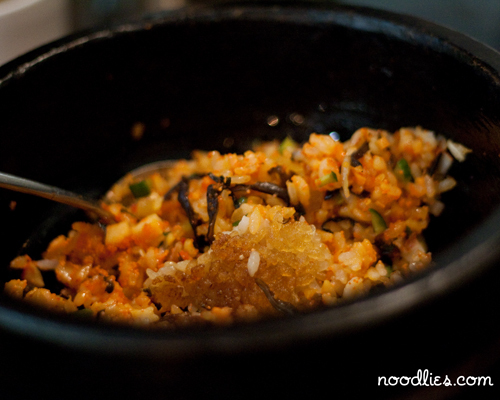 It was stunning, burnt rice with fish roe and that you can do this with bi bim bap too! Can you see the burnt/crusty rice? Burnt crispy rice, one of my favourites! Vietnamese like it too.. just didn't know other cultures like it too, John! Yum! Love Korean food, loved you post. Cheers! Mmmm love the crispy rice!! Yep I reckon Korean food will be more mainstream soon.. love crispy rice! Yep and the CBD, campsie, strathfield and burwood.. yum! Hey buddy, good morning. Interesting post. You have gained a new fan. Please keep up the good work and I look forward to more of your amazing posts.